This particular Scutellaria looks a lot like many of our blue-flowering Salvias. And there’s a good reason for that: they’re in the same plant family, the mint family. Even though heartleaf skullcap may look tender, it’s actually a very cold tolerant native plant. This fuzzy gray groundcover emerges after hot weather to spread among dormant perennials or to join winter annuals, even in snow! Grow it in part sun to dappled light. It likes to be on the dry side, too, so don’t overwater. 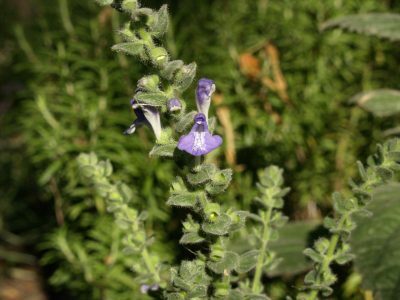 In spring, Heartleaf skullcap sends out little purple flower spikes that attract beneficial pollinators and hummingbirds. But, the oil it its leaves confers some deer resistance. As soon as it gets hot, it will go underground. Depending on weather, it may be slow to return, but will always come back in cooler weather. Its fleshy roots will spread, so you can dig them up and move to new areas where you want to cover bare winter ground with fuzzy gray foliage.